... learn how to install a defense on the field and/or learn the fundamental concepts of the technical aspects of the game of defensive football. Randy Pippin’s new book, C.H.A.O.S. 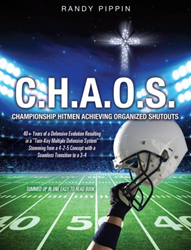 - Championship Hitmen Achieving Organized Shutouts, ($29.99, paperback, 9781498440486; $7.99, e-book, 9781498440493) teaches coaches and aspiring coaches "how to install" a multiple defense stemming from a 4-2-5 that seamlessly transitions to a 3-4. It’s a system tested, proven, complete, progressive, simple, multiple, flexible, aggressive, and fun. This is a highly comprehensive manual on installing any or all-basic defensive schemes along with any or all basic stunts, blitzes and/or coverage concepts in the game of football. At the same time it provides a component of significant personal development for readers to learn for themselves then pass on to the person that needs to hear the message or learn the fundamental concepts of the technical aspects of the game of defensive football. Randy Pippin has 40+ years of playing, coaching and teaching the game of football. He is responsible for sharing his abilities with thousands of kids coaches and families in 8 states including Texas, Tennessee, Georgia, Alabama, Mississippi, Oklahoma, Colorado and Minnesota. His impressive approach combined coaching athletic skills with integrating and teaching all of the character qualities that the game entails. Randy was awarded 1st Place in the Missions category of The Christian Author’s Award in Fall 2015 for this outstanding book. Xulon Press, a division of Salem Media Group, is the world’s largest Christian self-publisher, with more than 15,000 titles published to date. Retailers may order C.H.A.O.S. - Championship Hitmen Achieving Organized Shutouts through Ingram Book Company and/or Spring Arbor Book Distributors. The book is available online through xulonpress.com/bookstore, amazon.com, and barnesandnoble.com.